Lingual appliances are fitted to the inside of the teeth so they are completely invisible. Lingual braces are the discrete way to straighten teeth, providing the perfect cosmetic alternative to conventional braces that are often excessively visible for some patients. Lingual braces are comprised of small brackets and arch wires that are bonded to the back of the teeth for ultimate discreetness.The braces work in very much the same way as traditional braces to effectively straighten your teeth. 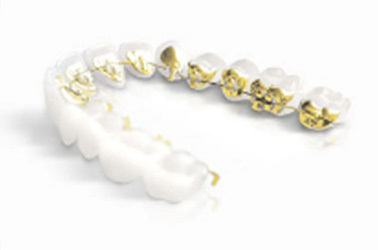 The Incognito™ brace is the very latest advance in invisible lingual orthodontics and its cast-gold brackets are custom-made to fit onto the inside (lingual) surface of your teeth making it virtually invisible. Unseen from the outside: the Incognito™ system is ideal for all those not wanting to forego aesthetics for professional or private reasons. Tailor-made for you: as unique as your teeth, Incognito™ Braces are individually made for your teeth using the latest technology, ensuring a perfect fit from the outset. Pleasant wearing comfort: Incognito™ Braces’ tailor-made and extremely flat design ensure a high degree of wearing comfort and fast adaptation to speech. In terms of treatment success: Incognito™ Braces function just as efficiently and quickly as visible braces. Please contact the practice for more information on Lingual Braces.